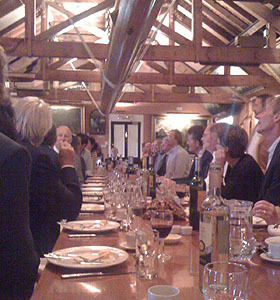 All week the America’s Cup has been on show in Cowes, courtesy of its new holders, BMW Oracle Racing. 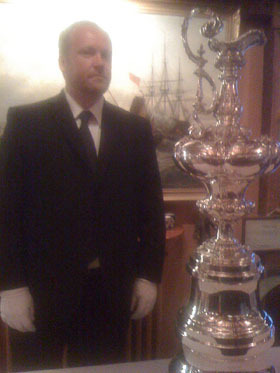 And last night it made a guest appearance at the annual Yachting Journalists’ Association dinner at the Sir Max Aitken Museum, sweeping in on the arms of a pair of burly minders like a mega-celebrity. In the flesh, it’s an impressive piece of silverware and much bigger than I’d imagined. Even yachting scribes who have contemplated their reflection in its glittering flanks many times over the years all cooed and there was a rush to extract cameraphones and pose beside it. We learned that the Cup was made in 1848, three years before the 100 Pound Cup race that kickstarted the whole thing and that it is now much taller by virtue of two additions to the pedestal. The first was put on in 1958 to make room for more engraving, the second in 1992 for the same reason. Tom Ehman of BMW Oracle pointed out that when Alinghi won the Cup they engraved their names in a font point size one-and-half-times greater than all predecessors. He was pleased to say that the current holders have reverted to the traditional size of engraving and he laughingly added that after adding BMW Oracle’s name the Alinghi engraving had been rotated to the rear. We were allowed close to the Cup but anytime anyone looked as if they were about to touch it one of two white-gloved heavies closed in. The Cup is guarded while on display. One of the security men told me it weighs 55lb. The Cup was back on display ashore while the two teams raced round the Isle of Wight today and created the same buzz among the guests gathered at the 1851 Cup marquee. It’s amazing to witness – and experience – the deep reverence it arouses yet at the same time you can’t help but acknowledge the slight preposterousness of it. 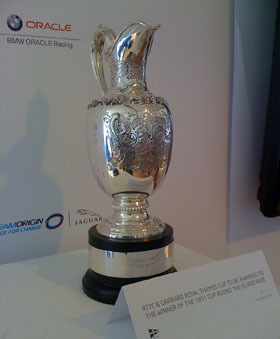 It’s as if the America’s Cup were a reliquary of saint’s bones, or a portion of the Turin Shroud. While watching the start of the race I happened to be talking to Brendan Gallagher, sports columnist for the Daily Telegraph, about the way big sporting trophies have become modern day holy relics. He told me all the big sports trophies attract the same mixture of awe and reverence: the Rugby World Cup; the Claret Jug and of course The Ashes. “The Ashes really are a relic,” commented Brendan. Well, hopefully here is new relic in the making: a little jug made by Garrards and bought three weeks ago as the 1851 Cup for the round the island race. It’s a really pretty trophy and here’s to it creating a long and distinguished history.